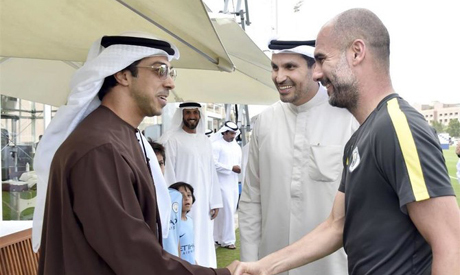 Manchester City manager Pep Guardiola believes owner Sheikh Mansour bin Zayed al-Nahyan's impact on the club has not just been down to his continued financial support but also smart decision-making in bringing success to the Etihad Stadium. City's annual report this week showed Sheikh Mansour of the Abu Dhabi ruling family spent more than 1.3 billion pounds ($1.70 billion) on the club since he took over in 2008. They have lifted three Premier League titles and the FA Cup over the last decade, and Guardiola insists it was a result of the owner's trust in the right people to take the club forward. "He's the most important person to help all of us at Manchester City to make a step in front," Guardiola told reporters on Friday. "Because not just with the money you can (be successful). The money is so important but after they choose the right people, from the beginning 10 years ago to make a step forward. "He follows us every weekend, every game. I was really impressed when I spoke with him. He knows absolutely everything, what happened here, the team, the way we play, or what happens with the club – he's involved." Guardiola added Raheem Sterling is in contention for Saturday's league visit of Fulham after the English forward missed international games against Spain and Switzerland with a back problem. Sterling's current contract at City expires in 2020 and British media reports this week said the 23-year-old was seeking a 275,000 pounds a week deal, which would make him one of the club's highest paid players. Although Guardiola is not part of the negotiations, he wants the player to commit his long-term future to City. "It's well known that we are delighted about him. We would like to continue," the Spaniard said. "The club has my opinion about that. Sometimes these kind of thing needs their own time. (What's) important is Raheem and his people know how delighted we are with him but after that, maybe it happens, maybe not."